The global cancer immunotherapy market is prognosticated to encounter a high rate of development over the coming years, inferable from the rise in number of people suffering from different types of cancers. In 2015, the global cancer immunotherapy market was esteemed at US$37.50 bn. its revenue is anticipated to progress at an extremely solid CAGR of 14.6% inside a conjecture period from 2016 to 2024, the global cancer immunotherapy market is required to achieve US$124.88 bn before the finish of 2024. In terms of area of therapy, the global cancer immunotherapy market is divided into blood cancer, prostate cancer, melanoma, breast cancer, lung cancer, colorectal cancer, and other minor areas. Of these, breast cancer has been the leading area of immunotherapy. Lung cancer is also showing a very high increase in rate of demand owing to the growing population of smokers and the higher overall air pollution in urban areas. Geography-wise, the global cancer immunotherapy market is divided into Europe, North America, Asia Pacific, and rest of the world. The market's past has pretty much been established inside the created economies of the world. Europe and North America have been a base for a few of the best level innovative work in the global cancer immunotherapy market up until this point. The two regions have likewise represented a lot of demand for cancer immunotherapy inferable from a more awareness in population and improved healthcare care, globally. 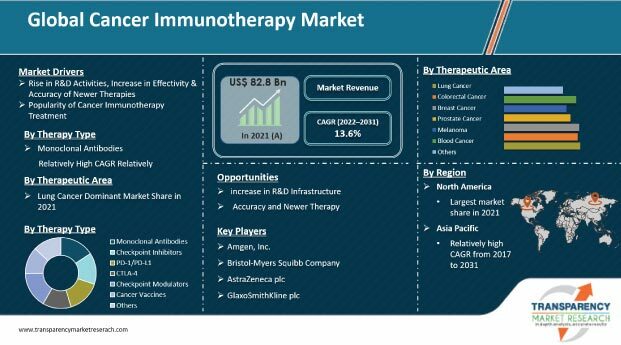 The key players operating in the global cancer immunotherapy market are Amgen, Inc., Bristol-Myers Squibb Company, AstraZeneca Plc., GlaxoSmithKline Plc., Eli Lilly and Company, F. Hoffmann-La Roche Ltd., Sanofi, Janssen Biotech, Inc., Merck & Co., Inc., Pfizer, Inc., Spectrum Pharmaceuticals, Inc., Novartis AG, and Takeda Pharmaceuticals.